Users can select a time range using drag and drop. 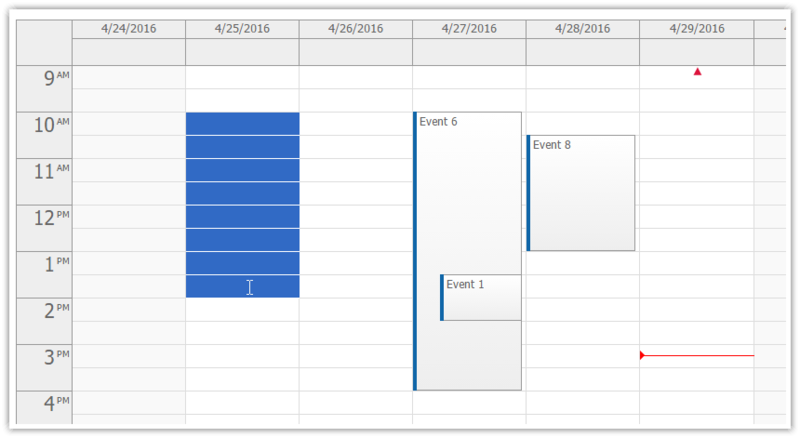 This feature can be used to create new events or copy existing events. Time range selecting is enabled by default. You can disable it by setting timeRangeSelectedHandling property to "Disabled". The time range is not cleared automatically when the event handler is fired. You can clear it using .clearSelection() method. Time range selecting is disabled by default. You can enable it using TimeRangeSelectedHandling. Persistent time range selection (selection that doesn't fire TimeRangeSelected right after the dragging is finished - TimeRangeSelectedHandling is set to Hold or HoldForever) can be used to display a context menu.